The DDMS perspective can be used to monitor application processes, as well as interact with the emulator. 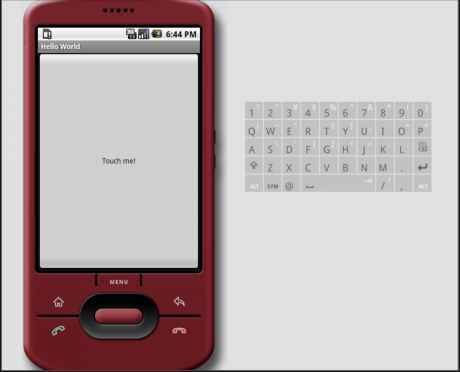 You can simulate voice calls and send SMS messages to the emulator. You can send a mock location fix to the emulator to mimic location-based services. You will learn more about DDMS and the other tools available to Android developers in Hour 2, Mastering the Android Development Tools. There are four building blocks to an Android application Once you have decided what components you need for your application, you should list them in a file called AndroidManifest.xml. This is an XML file where you declare the components of your application and what their capabilities and requirements are. See the Android manifest file documentation for complete details. The Android emulator is probably the most powerful tool at a developer's disposal. It is important for developers to learn to use the emulator and understand its limitations. 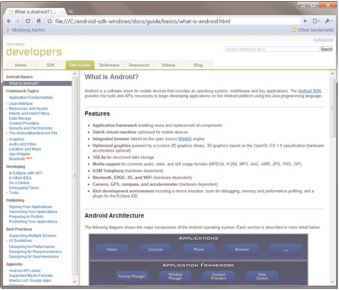 The Android emulator is integrated with Eclipse, using the ADT plug-in for the Eclipse IDE. 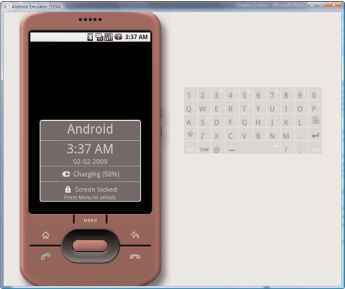 The Android emulator is a convenient tool, but it has a number of limitations Using Android emulator is not a substitute for testing on a true target handset or device. The ADT plugin provides a New Project Wizard that you can use to quickly create a new Android project (or a project from existing code). To create a new project 2. Select Android > Android Project, and click Next. o Under Target, select an Android target to be used as the project's Build Target. The Build Target specifies which Android platform you'd like your application built against. Enter a Min SDK Version. This is an integer that indicates the minimum API Level required to properly run your application. Entering this here automatically sets the minSdkVersionattribute in the < uses-sdk> of your Android Manifest file. If you're unsure of the appropriate API Level to use, copy the API Level listed for the Build Target you selected in the Target tab. AndroidManifest.xml The Android Manifest for your project. See The AndroidManifest.xml File. The Android emulator starts up, which might take a moment. 9. Click on the My First Android Application icon to launch the application again. Figure 3.10 My First Android App running in the emulator. 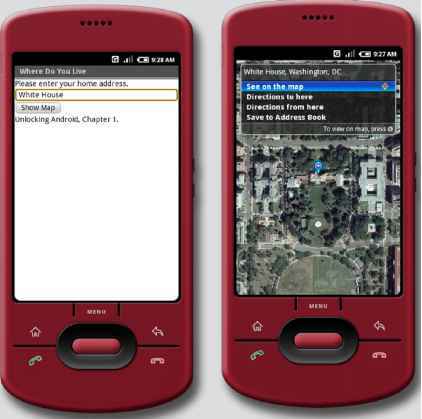 Figure 3.10 My First Android App running in the emulator. Figure 3.11 My First Android App application icon in the Drawer. You can create a new Android project in much the same way as when you added the Snake application to your Eclipse workspace. The first thing you need to do is create a new project in your Eclipse workspace.The Android Project Wizard creates all the required files for an Android application. 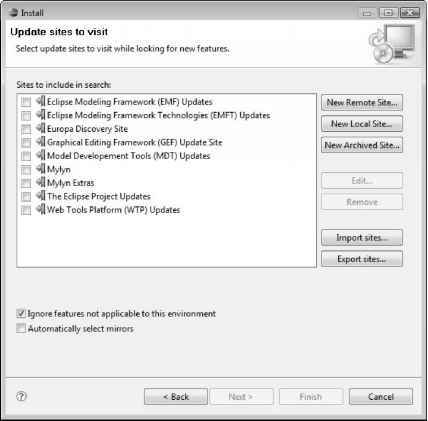 Follow these steps within Eclipse to create a new project 1. Choose File, New,Android Project, or choose the Android Project creator icon, which looks like a folder (with the letter a and a plus sign), on the Eclipse toolbar. 5. Choose an application name.The application name is the friendly name of the application and the name shown with the icon on the application launcher. In this case, the Application Name is My First Android App. Using the Android Eclipse plugin is the fastest and easiest way to start creating a new Android application. The plugin automatically generates the correct project structure for your application, and keeps the resources compiled for you automatically. It is still a good idea to know what is going on though. Take a look at Overview of an Android Application to understand the basics of how an Android application works. Finally, a great way to started with Android development in Eclipse is to follow both the Hello Android and Notepad code tutorials. In particular, the start of the Hello Android tutorial is an excellent introduction to creating a new Android application in Eclipse. Android applications can be compiled for compatibility with several different SDK versions. You use the < uses-sdk> tag to specify the minimum SDK required on the handset in order for the application to build and run properly. 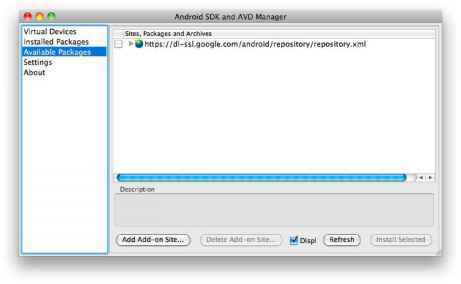 The android minSdkVersion attribute of this tag is an integer representing the minimum Android SDK version required. Table 5.1 shows the Android SDK versions available for shipping applications. TABLE 5.1 Android SDK Versions Available TABLE 5.1 Android SDK Versions Available Android SDK Version Each time a new Android SDK is released, you can find the SDK version number in the SDK release notes. This is often referred to as the API Level within the tools, especially the Android SDK and AVD Manager. The AndroidManifest.xml is a required file for every Android application. It is located in the root folder of the application, and describes global values for your package, including the application components (activities, services, etc) that the package exposes to the 'outer world', what kind of data each of our Activities and co. can handle, and how they can be launched. AndroidManifest.xml. The following list describes the structure and files of an Android application. Many of these files can be built for you (or stubbed out) by the activityCreator.py application shipped in the tools menu of the SDK. 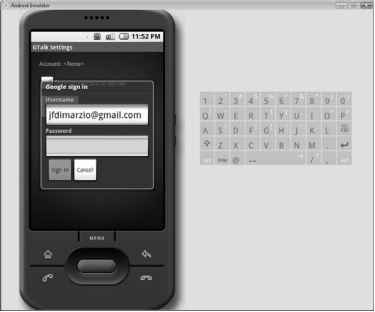 See Building an Android Sample Application for more information on using activityCreator.py. AndroidManifest.xml (required) Advertises the screens that this application provides, where they can be launched (from the main program menu or elsewhere), any content providers it implements and what kind of data they handle, where the implementation classes are, and other application-wide information. Syntax details for this file are described in AndroidManifest.xml. Perhaps the most popular question asked concerning the marketing of an Android app is, How do I get my app in the top paid apps for my category Developers know that if they can get their apps into the top paid apps, they are certain to see significant numbers of downloads and huge sales volume. This is an accurate assumption and was described as hitting the grand slam in the first chapter of this book. Being in the top category in app sales is the Holy Qrail for Android app developers. In this chapter, we will review the key elements of a successful app, which include pricing, promotions, positioning, and integration, to name a few. Doing all these well to the extent possible will increase your chances of building the next best-selling Android app. After installing the Android plugin for Eclipse, Eclipse should have prompted you to restart the application. If it did not prompt you, restart Eclipse now. Restarting Eclipse will ensure that the program has a chance to reinitialize with the plugin installed. It is The Android plugin for Eclipse is configured from the Preferences window of Eclipse. Proceed as follows 2. In the Preferences window, shown next, select Android in the menu on the left. On the right side of the window, click Browse, find the location of the Android SDK on your hard drive, and enter it in the SDK Location field. Eclipse needs this information to be able to access all the tools that are supplied with Android, such as the emulator. Every application must have an AndroidManifest.xml file (with precisely that name) in its root directory. The manifest presents essential information about the application to the Android system, information the system must have before it can run any of the application's code. Among other things, the manifest does the following It describes the components of the application the activities, services, broadcast receivers, and content providers that the application is composed of. It names the classes that implement each of the components and publishes their capabilities (for example, which Intent messages they can handle). These declarations let the Android system know what the components are and under what conditions they can be launched. We are going to build a simple application that gives us the opportunity to modify the UI, provides a little application logic, then executes the application in the Android Emulator. More complex applications are left for later chapters our focus here is on the development tools. Building an Android application is not too much different from creating other types of Java applications in the Eclipse IDE. It all starts with choosing File > New and selecting an Android application as the build target. Like many development environments, Eclipse provides for a wizard interface to ease the task of creating a new application. We'll use the Android Project Wizard to get off to a quick start in building an Android application. All that is left to do is upload our signed binary to the Android Market. > You need to be a registered Android Developer to upload your app. If have not already registered, you can do so at http market.android.com publish signup. The process is quick and easy you just fill out a bit of profile information (name, email, phone, etc. ), pay a 25 registration fee (using Google Checkout), and agree to the Android Market Developer Distribution Agreement. Figure 8-4. Navigate to the Android Market upload page to submit your app Congrats Your app will be available in the Android Market almost immediately. Before release, you need to make a number of changes to the application configuration settings of the Android manifest file. Some of these changes are simply common sense, and others are imposed by marketplaces such as the Android Market. You should review the Android manifest file as follows Verify that the application version code is set appropriately. The version code is a number that the Android platform uses to manage application upgrades. Consider incrementing the version code for the release candidate in order to differentiate it from the prerelease version of the application. Confirm that the application uses-sdk setting is set correctly. You can set the minimum, target, and maximum Android SDK versions supported with this build. These numbers are saved as the API level of each Android SDK. For example, Android 2.1 is API level 7. M f you've taken a glance at Chapter 18, you're probably well acquainted with the Android Market. There's a problem, though With hundreds of applications offered in the Market and more added every day, it can be nearly impossible to cut through the fat and figure out what's worth downloading. That's a tough problem to solve and no two people will love exactly the same Android applications but I've boiled down the treasure trove of goodies offered by the Market to a list of ten must-try apps. Go ahead and live it up. The applications are free, after all, and if you decide an app isn't for you, you can always uninstall it. The Android manifest file is a specially formatted XML file. You can edit the XML manually in the AndroidManifest.xml tab of the manifest file resource editor (see Figure 5.5). Figure 5.5 shows the Android manifest file for the Droidl project you created in the first hour, which has fairly simple XML. AndroidManifest .xml tab of the Eclipse manifest file resource editor. Figure 5.5 shows the Android manifest file for the Droidl project you created in the first hour, which has fairly simple XML. < manifest android versionCode 1 android versionName 1.0> < application android icon drawable icon Now the content provider is ready for other applications to use.To test this content provider, a new Android project can be created called DataStorageTester with main activity DataStorageTester.This is shown in Listing 9.20.An instance of the ContentResult is created to query the data from the DataStorage content provider.After a Cursor is returned, the testing function parses the second column of each data entry and concatenates into a String to display on the screen using a StringBuilder object. The table below lists the intents that your application can send, to invoke Google applications on Android devices in certain ways. For each action uri pair, the table describes how the receiving Google application handles the intent. A zoom of 1.0 is 90 degree horizontal FOV for a nominal landscape mode 4 x 3 aspect ratio display Android phones in portrait mode will adjust the zoom so that the vertical FOV is approximately the same as the landscape vertical FOV. This means that the horizontal FOV of an Android phone in portrait mode is much narrower than in landscape mode. This is done to minimize the fisheye lens effect that would be present if a 90 degree horizontal FOV was used in portrait mode. Android is a mobile platform that will be released as open source and available for free use by anybody. This means that there will be many Android-based products available to consumers, and most of them will be created without the knowledge or participation of the Android Open Source Project. Like the maintainers of other open source projects, we cannot build and release patches for the entire ecosystem of products using Android. Instead, we will work diligently to find and fix flaws as quickly as possible and to distribute those fixes to the manufacturers of the products. Before we go any further, you need to become familiar with debugging in the emulator. To illustrate some useful debugging tools, let's manufacture an error in the My First Android Application. It takes a moment for the emulator to start up and for the debugger to attach. If this is the first time you've debugged an Android application, you need to click through some dialog Figure 3.12 My First Android App crashing gracefully. Figure 3.12 My First Android App crashing gracefully. Figure 3.13 Switching debug perspectives for Android emulator debugging. Figure 3.13 Switching debug perspectives for Android emulator debugging. Figure 3.14 Debugging My First Android App in Eclipse. Figure 3.14 Debugging My First Android App in Eclipse. Your Android applications will be built from four basic component types that are defined by the Android architecture These respond to requests for service from another application. A Broadcast Receiver responds to a system-wide announcement of an event. These announcements can come from Android itself (e.g., battery low) or from any program running on the system. 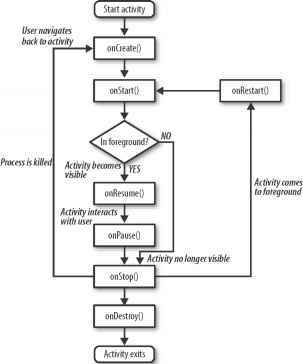 An Activity or Service provides other applications with access to its functionality by executing an Intent Receiver, a small piece of executable code that responds to requests for data or services from other activities. The requesting (client) activity issues an Intent, leaving it up to the Android framework to figure out which application should receive and act on it. Every Android application has a set of core files that are created and are used to define the functionality of the application (see Table 3.1).The following files are created by default with a new Android application. Figure 3.8 Configuring My First Android App using the Android Project Wizard. Figure 3.8 Configuring My First Android App using the Android Project Wizard. The Android application framework provides everything necessary to implement your average application.The Android application lifecycle involves the following key components Android applications can interact with the operating system and underlying hardware using a collection of managers. Each manager is responsible for keeping the state of some underlying system service. For example, there is a LocationManager that facilitates interaction with the location-based services available on the handset. The viewManager and WindowManager manage user interface fundamentals. Use Application Installer to install Android applications (.apk) that are on your PC to the phone. Important The Unknown sources check box in Settings needs to be selected to be able install Android applications from the PC. To check, press HOME > MENU, and then tap Settings > Applications. Double-click one of the running Android devices. There should be one listed for each handset plugged into the machine, in addition to one for each emulator instance running. If you do not see the handset listed, check your cables and make sure you installed the appropriate drivers, as explained in Appendix A. Eclipse now installs the Android application on the handset, attaches a debugger, and runs the application. Your handset now shows a screen very similar to the one you saw in the emulator. If you look at the DDMS perspective in Eclipse, you see that logging information is available, and many features of the DDMS perspective work with real handsets as well as the emulator. Unlike most traditional environments, Android applications have limited control over their own life cycles. Instead, application components must listen for changes in the application state and react accordingly, taking particular care to be prepared for untimely termination. By default, each Android application runs in its own process, each of which is running a separate instance of Dalvik. Memory and process management is handled exclusively by the run time. Classical computer science classes often define a program in terms of functionality and data, and Android applications are no different. They perform tasks, display information to the screen, and act upon data from a variety of sources. Developing Android applications for mobile devices with limited resources requires a thorough understanding of the application lifecycle. Android also uses its own terminology for these application building blocks terms such as Context, Activity, and intent.This chapter familiarizes you with the most important components of Android applications. This section jumps right into the fray of Android development to focus on an important component of the Android platform, then expands to take a broader view of how Android applications are constructed. An important and recurring theme of Android development is the Intent. An Intent in Android describes what you want to do. This may look like I want to look up a contact record, or Please launch this website, or Show the Order Confirmation Screen. Intents are important because they not only facilitate navigation in an innovative way as discussed next, but they also represent the most important aspect of Android coding. Understand the Intent, understand Android. The next section provides foundational information about why Intents are important, then describes how Intents work. Beyond the introduction of the Intent, the remainder of this chapter describes the major elements of Android application development leading up to and including the first complete application. The Alex is a simple eBook reader with an E-ink screen on top and an Android touchscreen on the bottom. E-ink is the patented display technology behind the Amazon Kindle and many other eBook readers. It's a form of electronic paper that looks great in full sunlight and requires low power usage. This device uses Wi-Fi to download books, but it can also run built-in Android apps. This would be a good choice for people familiar with Android on their phone or people who want to give Android a whirl without committing to a phone plan. The Barnes & Noble Nook also runs on Android, but it is heavily modified. Android applications consist of loosely coupled components, bound by an application manifest that describes each component and how they all interact, as well as the application metadata including its hardware and platform requirements. > Content Providers Shareable data stores. Content Providers are used to manage and share application databases. They're the preferred means of sharing data across application boundaries. This means that you can configure your own Content Providers to permit access from other applications and use Content Providers exposed by others to access their stored data. Android devices include several native Content Providers that expose useful databases like the media store and contact details. You'll learn how to create and use Content Providers in Chapter 7. The Android debug bridge (ADB) is a client-service application that lets you connect with an Android Emulator or device. It's made up of three components a daemon running on the emulator, a service that runs on your development hardware, and client applications (like the DDMS) that communicate with the daemon through the service. 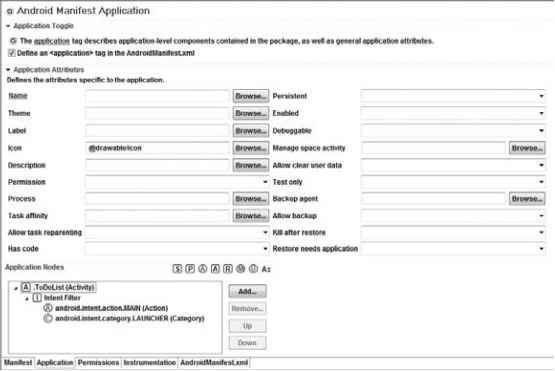 High-level permissions restricting access to entire components of the system or application can be applied through your AndroidManifest.xml. All that this requires is including an android permission attribute on the desired component, naming the permission that will be used to control access to it. If you've read Getting Started and Developing Apps, then you know how to build an Android application. (If you haven't read those sections you should now.) A manifesto explaining a technical philosophy and perspective that Android developers will find useful. By reading this page, you'll learn how to write applications that perform well on embedded devices (such as phone handsets), and that play nicely with other parts of the system. Describes how to use the APIs for accessing Google services that are installed on many Android devices. If you want to set custom hardware emulation options for the AVD, enter yes and set values as needed. If you want to use the default hardware emulation options for the AVD, just press the return key (the default is no). The android tool creates the AVD with name and system image mapping you requested, with the options you specified. 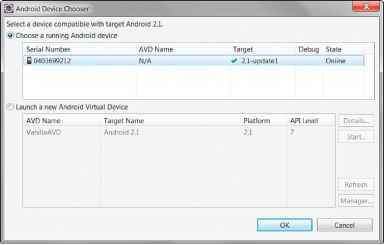 If you are creating an AVD whose target is an SDK add-on, the android tool does not allow you to set hardware emulation options. It assumes that the provider of the add-on has set emulation options appropriately for the device that the add-on is modeling, and so prevents you from resetting the options. The Android SDK is a set of tools and libraries for creating native Android applications. The Android SDK also includes an emulator that enables you to test your Android application before deploying it to an actual Android handset. You can download the Android SDK from http code.google.com Android download.html. Before you can begin coding this project, you need to adjust a development setting on the Android Emulator, XMPP Settings. With the project open, you need to depart from your routine for a minute. If you are familiar with GTalk, you are aware that you can use the product only when you log into your Google account. Therefore, you must take an extra step now to ensure that your device (in this case, the Android Emulator) can log into your Google account, thus enabling you to send and receive messages. After you input your Username and Password, click Sign In. The Android Emulator should now attempt to authenticate your information. While the Emulator attempts to authenticate your information, it shows an Authenticating message. You can use numerous marketing activities to gain exposure and sales for your app. Because the Android Market and Android apps are relatively new in the world of commerce, there is a learning curve in understanding what works and what doesn't for marketing apps through the store and from your own product website. In this chapter we'll discuss 25 Android marketing activities that are essential to your sales success. Some of these activities we have discussed in more detail in other chapters, but they are brought together here into a single list for easy reference. As you create your marketing plan, you can review this list to ensure that all these activities are being performed at different points in your plan from pre-launch to post-launch and during your ongoing marketing campaigns. These marketing activities are grouped by category and are not in any specific order. Appportunity will be instantly available for you to download right after your purchase. No shipping fees, no delays, no waiting to get started.